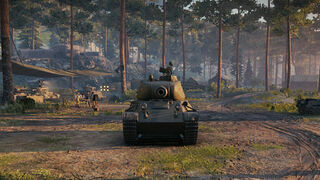 The LTTB is a Soviet tier 8 light tank. More or less the T-50-2 with physics applied. 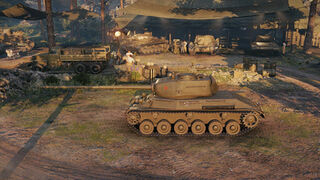 The LTTB leads to the T-54, and the T-54 ltwt..
Well armored and highest HP pool for its tier and class. Downright amazing power to weight ratio with top engine, accelerates in a snap and can go 30-35 km/h up rather steep hills. Good top speed with top engine (Though with the hp/t, expect speeds more in the range of 73-75). Turns well at high speeds and turns very quickly at low speeds; stops in a snap. Very good penetration and alpha with top gun; can exploit most higher tier tanks weak spots with ease. Bad gun elevation arc (-5°/+15°). In some respects this tank is nearly as odd as the T-28 in terms of its role, except unlike the T-28 it has more going for it. It actually has both good hull armor and turret armor unlike virtually all of the other light tanks in its tier, those who were frustrated by the MT-25's firepower will begin to really like the LTTB's top gun, as it fares unbelievably better against more heavily armored foes. 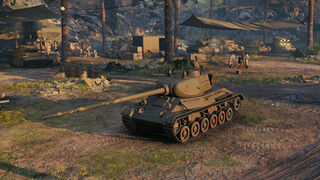 The top gun also has good accuracy and the exact same aim time as the Ru-251. However the poor elevation and depression angles mean that you will very often struggle to hit the enemies in front of you, or miss them because you drive onto a bump at the time you shoot. Try to avoid ridge lines and hilly terrain because you will be completely outplayed there. The good speed and fantastic horsepower per ton on the top engine make actually harassing a armored opponent all the more tempting, but remember, you still are outmatched in armor even with the LTTBs surprisingly good armor ratings. The armor of the LTTB simply allows you to harass for somewhat longer periods of time (to a point it almost seems like your just directly engaging) before you have to escape with the LTTB's good agility and amazing acceleration. The good top radio means that this seemingly perfect all-rounder light tank can even scout, and it does have a decent enough size to do so pretty well. However the LTTB appears at first glance to be played more as a precision ambusher, coming out of nowhere to unload multiple shots into a tanks exposed weak spots and then darting away before anyone can react. The LTTB, when looking at it on paper, also appears to be able to hunt down and eliminate other light tanks with relative success. If you do wish to use this tank in such a role, getting light spall liner can help the LTTB much more easily survive other tanks that try to kill it via ramming. Enhanced suspension will also make getting tracked due to collisions more difficult. 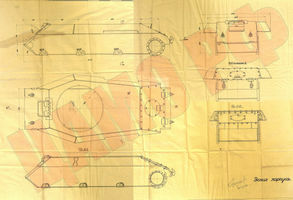 The LTTB (legkij tank tyazhelnogo bronirovanya – “light tank with heavy armor”) was proposed by the Kirov Leningrad Plant No. 174 as a replacement of the T-80 light tank in February 1944. The tank was proposed to have a hull in a shape that was as armored as the T-44 (90mm frontal armor, 62 degrees), it had a bigger turret ring than the T-34/85 though and its suspension resembled the T-100 heavy tank. It should be armed by an 85mm S-53 gun and powered by a 400hp V8 engine. No prototypes of this tank were built. The only thing that actually existed was a drawing of the hull. The turret was not designed. Wargaming is using a regular T-34/85 turret with slightly enlarged turret ring (1600 to 1660mm) for the LTTB. A turret was never designed for the LTTB. Its only intended armament is the 85 mm S-53 gun. The 85 mm D5T-85BM was only developed for the SU-85. Its only intended powerplant is a 400hp V8 engine. This page was last modified on 24 July 2018, at 15:21.